What a start to the college basketball season. On Saturday, the Penn men’s basketball team hosted Temple in what marked the earliest season-opener in program history. But it felt more like March inside than the Palestra than early November. From a sold-out Homecoming crowd to the return of former Penn head coach Fran Dunphy to breakout performances to a gutsy Quaker comeback to Miles Jackson-Cartwright yelling to me, “We ain’t going nowhere Dave!” in the midst of Penn’s comeback to a dramatic final minute to Bill Cosby performing his stand-up routine afterwards, this game had it all. 2. Sophomores Tony Hicks and Darien Nelson-Henry are the real deal. Hicks was absolutely incredible against the Owls, scoring 28 points, getting to the hoop at will and scoring eight straight points, including a tough 3-pointer at the end of the shot clock, to give the Quakers their short-lived lead. Nelson-Henry, meanwhile, was a force inside, looked to be in much better shape than last season and finished with 19 points and 10 rebounds. It was incredible to see both of them become Penn’s go-to players in crunch time a year after both showed flashes of potential but also struggled with consistency as freshmen. Hicks and Nelson-Henry might just be the best underclassmen tandem in the city, and they certainly pose the biggest threat to Harvard winning its fourth straight Ivy League championship. 3. With a couple of terrific sophomores and a strong senior class led by Jackson-Cartwright and Fran Dougherty, this Penn team is similarly constructed to the 2011-12 team that finished just short of winning the Ivy title. The problem with that team, though, was a lack of depth. That shouldn’t be an issue for this squad, which has 18 players on its roster. But the key will be to get better production out of the point guard spot (Jamal Lewis, Camryn Crocker and freshman Tony Bagtas didn’t score in 30 combined minutes) and for one or two of the freshmen to assume an important role. Against the Owls, rookies Bagtas, Dylan Jones and Matt Howard got into the game but all seemed to have some first-game jitters. 4. After the game, Allen rightly called out his team’s rebounding and defensive deficiencies. The Quakers were outrebounded, 49-35, but the problems actually ran deeper than that as they allowed 20 offensive rebounds, were seemingly beaten to every loose ball and let Temple get a lot of open looks from behind the arc when they played zone. And, keep in mind, this is a Temple team that is very young and inexperienced. 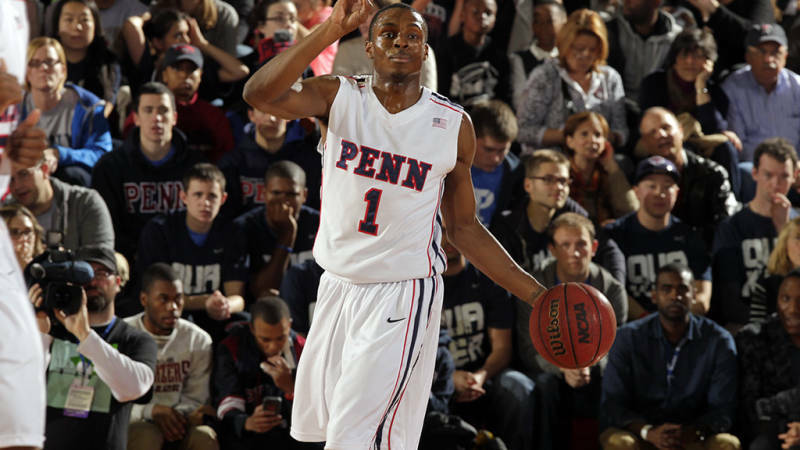 The Quakers have to do better on the glass and with their perimeter defending to make a serious run at the Ivy title. 5. As evidenced by the fact that he played 13 players (more than Temple has on its entire roster), Allen’s rotation is still in flux – but not nearly to the extent as it was last season at this time. Even with 13 players getting onto the floor, the core four of Jackson-Cartwright, Dougherty, Nelson-Henry and Hicks played 38 minutes, 26 minutes, 28 minutes and 34 minutes, respectively. And junior forward Henry Brooks logged 26 minutes off the bench, playing the final stretch of the game as Allen opted to go with two guards instead of Penn’s traditional three-guard lineup. That kind of lineup could prove to be a nightmare for Ivy teams to defend – but only if Brooks can emerge as a dangerous sixth man.